....THIS SISTER IS A PRINCE! Sister Charitas Prince was born on October 19, 1910 in Cooks Valley, Wisconsin. She attended St. John Baptist Catholic Grade School as well as the public school in the county. After graduating from the 8th grade, her family moved to Chippewa Falls, Wisconsin. As a result, she was able to attend McDonell Catholic High School in Chippewa Falls. Sister became acquainted with the Hospital Sisters while working at St. Joseph's Hospital in Chippewa Falls during her high school years. She stated that even as a young girl she had three goals - to be a Sister, to be a nurse and to be a missionary. In order to accomplish them, she entered the Hospital Sisters on October 15, 1927 and professed her religious vows in 1930. Following her profession of vows, Sister began her nursing education at St. John's School of Nursing in Springfield, Illinois. She graduated from there in 1932. So she had now accomplished two of her three goals at the age of 22. How soon could she accomplish goal # 3? Sister obtained additional education at DePaul University, Chicago earning both a Bachelors and Masters of Science Degree in Biological Science. 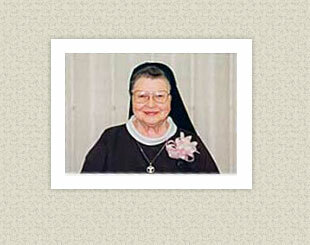 With this knowledge, Sister Charitas began a long career of teaching at St. John's School of Nursing in Springfield. She taught Nursing Arts, medical and surgical nursing, as well as the biological sciences. In addition to teaching the nursing students, Sister taught Anatomy and Physiology to students in anesthesia, inhalation therapy, radiology and laboratory programs at St. John's Hospital. Still Sister Charitas longed for missionary work. While teaching the nursing and other students, she worked actively and continuously in support of missionaries. For many years she collected coupons to provide revenue for the missions. She also worked with the Mission Sewing Club and the Council of Catholic Nurses on a variety of mission related projects. But the deep desire to go to a mission land persisted. Finally in 1972, Sister Charitas had her first real experience as a missionary to Kaohsiung, Taiwan. She continued to teach but now her teaching was conversational English. For 7 years, Sister taught at Ursuline Language College. She also taught English classes at two banks, at an industrial factory as well as private tutoring of adults. One of her favorite activities was serving as the grammarian for the Kaohsiung Toastmasters Club. After 10 years in the mission field, Sister returned to the USA. Following some well-deserved R & R, she went to Sacred Heart Hospital, Eau Claire, Wisconsin where she served in the Pastoral Care Department for several years. Still the missionary call was strong. So in 1989 Sister Charitas returned to Taiwan to work with the people. She taught English again but in a less structured setting. She also helped care for the patients at Star of the Sea Clinic in Kaohsuing. Sister Charitas returned to Springfield in 1993 and retired. By 1972 she had reached her original three goals. Even in her retirement she continues to fulfill the dreams she pursued as a young girl. Sister continues her missionary work from a distance. She makes craft items for bazaars where the proceeds benefit missions. She sits with Sisters who are dying and assists with other tasks around the Motherhouse. She spends many hours in the Adoration Chapel praying for the needs of the Church, especially in mission lands. Now you know why this Sister is a Prince!